FTP Scheduler Pro is an easy to use FTP file management tool that helps you to automate repetitive tasks with ease. Just simply create a schedule using the easy GUI by entering basic FTP site information (Host, Login/Pass, Port) and set the time (once daily, every hour or real time). 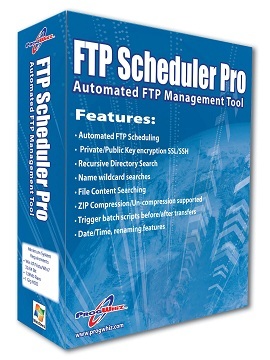 FTP Scheduler comes with powerful features such as support for Secure FTP protocols, ability archive and compress/uncompress files and search for files using wildcards, search file content and explore sub folders when you are not sure where the file resides. Please see below which details more of the feature rich functionality. Automate your FTP Transfers in minutes with easy-to-use FTP Scheduling software! Automate Repetitive manual FTP transfers. Support for Standard and Secure (SSH, SSL TTL) FTP Protocols. Ability to Search file content as the criteria to find the file. Ability to search files recursively in sub-folders. Compress/Uncompress files using the Zip algorithm before/after file transfers. Ability to set # of attempts to retry a transfer if unsuccessful.